Here’s a tasty idea I found on Cooking Light…along the lines of my recent post on Apple Pie In An Apple. This could be easily adapted for Vegetarians or Vegans too. Click on this link for details. 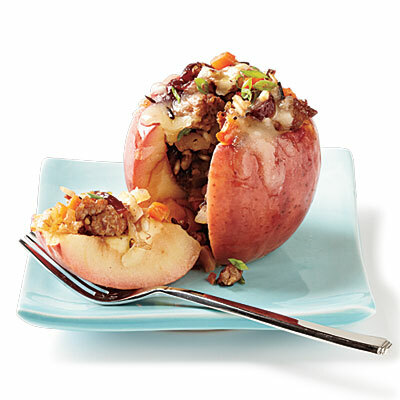 By changing up the flavors, you’ll be able to serve this for many occasions as a main course, or for a side dish I think that half an apple per person would be adequate (cut in half before stuffing). This could also be a good dish for entertaining, since you could easily make the stuffing a day or two ahead. It would be delicious with a Pork Roast or any poultry! If you’re like me and scrambling to finish your menu for Thanksgiving, time is running out! I’ve searched out a few recipes to share. 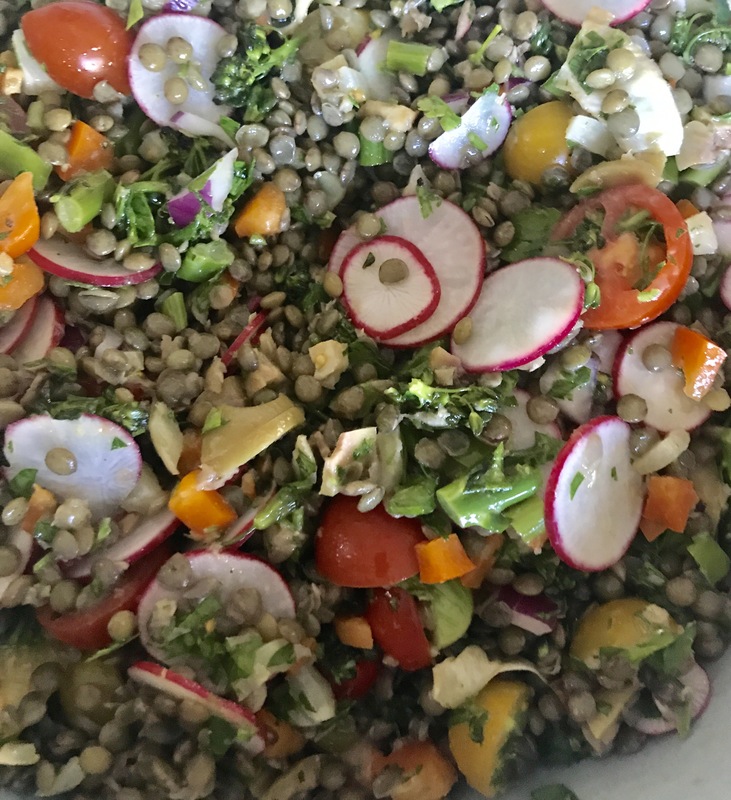 Due to limited time, I’m sharing the links to ones I’ve found online, rather than typing up my own recipes, but hopefully you will enjoy them nonetheless. 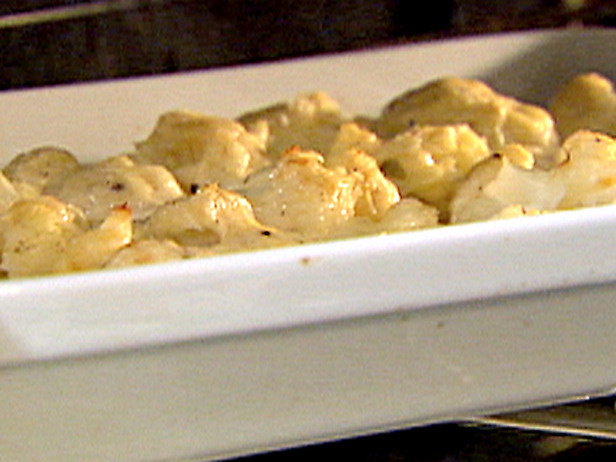 Cauliflower Gratin from Barefoot Contessa. Since more nutrients are retained by steaming vegetables rather than boiling them, you may want to consider modifying the recipe (you could steam the florets a day ahead too).Try to avoid ground Nutmeg from the spice rack–it’s really much better adding freshly grated Nutmeg! I also suggest using Japanese Panko Bread Crumbs for extra crunch. Pan-Roasted Balsamic Onions from Martha Stewart. This recipe includes Leeks, but as much as I love Leeks, I think I’ll substitute Shallots so they’ll fit more easily on everyone’s plate. Shallots will also take up less space than Leeks in a very full refrigerator and can be stored in a cool pantry. Adding a touch of honey or brown sugar would help caramelize them too. Chipotle Smashed Sweet Potatoes from Alton Brown. I would use a bit of caution and hold back on the amount of Chipotle Pepper, adding it to taste. A touch of Heavy Cream or Crème Fraîche, or perhaps 1-2 Tablespoons of Maple Syrup would also be good additions. And last, there is the Cranberry Sauce…there are so many options here. You can’t go wrong adding some Orange Juice or Zest. Try a dash of Chinese Five-Spice Powder which typically includes Star Anise, Cinnamon, Cloves, Sichuan Pepper and Fennel. I like to mix Whole Grain Mustard into my sauce which makes it a perfect pairing for a Turkey Sandwich the next day. If you go that route, consider saving some of the Cranberry Sauce separately, before adding the Mustard, since it’s tasty to layer into a Yoghurt and Granola Parfait. Do you have any favorite Sides for Thanksgiving? Share your ideas!